I thought that in 2015 I had read the best thrillers, then came along Solomon Creed by Simon Toyne. This is gripping barn storming adventure that will take the reader to places most thrillers would dare not venture. It is dark at times and has religious connotations throughout. So who is Solomon Creed? When a plane crashes in Arizona and starts a fire that spreads rapidly and threatens the small town of redemption, only one survivor crawls out the wreckage, he has no memory, he does not even know his own name, who is this barefooted man walking into Redemption? When the police pick him up on the edge of town and search him for identification the only item they find is a book, this is no ordinary book called ‘The Making of a Town’ and is written by Redemptions founder Jack ‘King’ Cassidy. The book has been signed Gifted to Solomon Creed by James Coronado. Now the police are wondering if this is Solomon Creed. What does he want? Why is he here? Many questions about this mysterious figure with no recollection of who he is or his purpose. The town of Redemption made its name and fortune in the gold and Copper that the towns founder discovered. Now with no more gold or copper to be found Redemption is a giant car park for redundant aircraft and an impressive stone church that is rather impressive to say the least. Simon Toyne is an amazing storyteller that has written an all action thriller that has many twists including a drug baron, corrupt cops, murders, and a town that seems to have lost it soul not to mention reality and seems to be a town more akin to the wild west not a modern day town. There is much for the reader to take in with plot twists as we get to grips with the mysterious Solomon Creed and his purpose. I must warn you now that this is a roller-coaster of a thriller of staggering proportions that you will not want to put down for too long. It has been the first of Simon Toyne’s novels I have read, which means I have some catching up to do. The ending is just as intriguing as this gives us clues as to what comes next for our all action ‘hero’ not giving too much away here as I want you to experience what this reviewer has experienced with Solomon Creed. An incredibly well written and executed novel that takes the reader back and forth and many plot twists that will keep you gripped to the book and you will not want to let it go. If you are looking for a thriller for a Christmas read. It is here with Solomon Creed. I loved the cover, it says a lots of what lies between the covers. Already looking forward to Toyne’s next thriller. 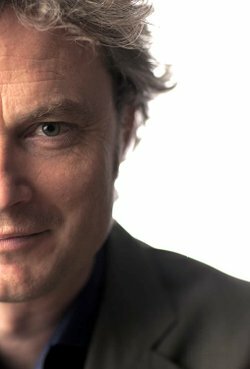 Simon Toyne is the international bestselling author of the Sanctus trilogy – Sanctus, The Key and The Tower – and the Solomon Creed series. He wrote Sanctus after quitting his job as a TV executive and it became the biggest selling debut thriller of 2011 in the UK. His books have been translated into 27 languages and published in over 50 countries. 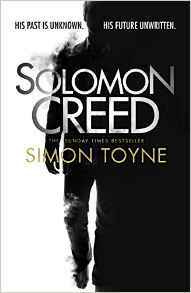 Posted on November 15, 2015, in HarperCollins, Simon Toyne, Solomon Creed. Bookmark the permalink. Leave a comment.